The wait is over, Apple’s iPad finally arrived last week and as usual it was sold out at most locations. Apple reported that they sold over 300,000 iPads on launch day…300,000! Developers have already launched apps for the iPad, although not as many apps are available to iPad users as there are to iPhone users; there are still quite a few options with more to come. What are some of the finance apps available on the iPad? I have used Bloomberg app on the iPhone for the past two years, however the iPad version makes Bloomberg an even greater app. This app allows you to follow financial news and track your portfolio, rather than looking up each security individually. 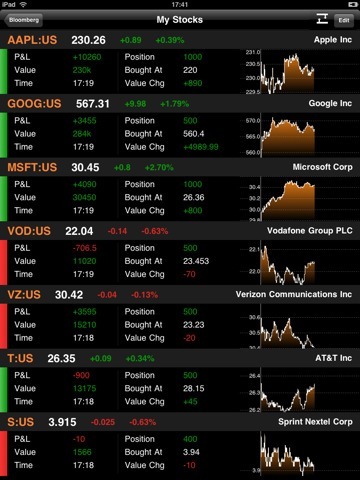 You can call up your dashboard with all the stocks you follow and on just one page you have all the important data regarding your stocks. You can select news from specific categories such commodities sector, bond market, or world wide news. This is a neat app to help you create a budget and track month-to-month spending. The app is very simple to use and can create customized categories. You can track balances in different accounts, however this will require manual input since the app does not connect to your bank. Do you need to follow financial news and keep track of the world markets? 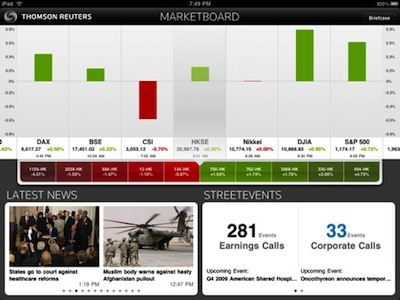 Thomson Reuters Marketboard may just be the right app for you. With this you can not only keep current with business news, but you can also track corporate events and earning announcements. This app is great for user who are interested in more detailed news rather then general news. 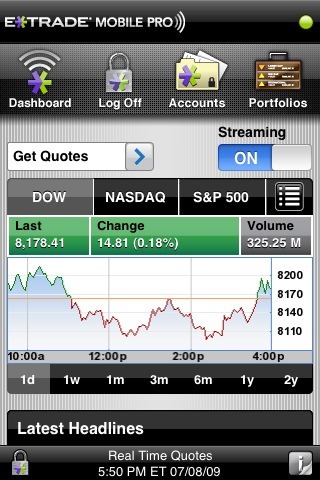 If you are a trader or like to keep a close eye on your stocks then this E*Trade app can come in handy. E*Trade Mobile Pro is available on the iPhone, however if you have ever tried to use the app on the iPhone you have probably realized that the small screen makes this a difficult task. E*Trade Mobile Pro on the iPad however makes this a somewhat more pleasant experience. With this app E*Trade customers can access their accounts, view live quotes, follow financial news and make trades. 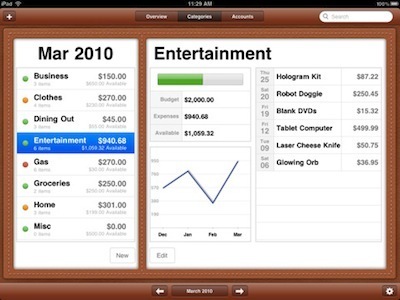 Although not necessarily a personal finance app, Dragon Dictation can be a very useful app for iPad users. Typing on the iPad has received mixed reviews from users, some find it okay while many are not very pleased with it. Dragon Dictation is a great app for those who will be typing a lot on the iPad, it’s simple to use and seems to do a very accurate job. 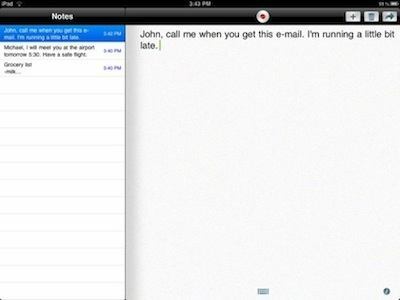 Dragon Dictation will translate your voice into text so no typing is required. iPad users unfortunately do not have as many options in terms of apps as iPhone users do, however I am sure many more apps will be developed over the next few months. What are your thoughts on the iPad? What are your favorite apps? Thanks for featuring these 5 apps! I love my iPad. I am hoping I can completely do away with my Mac and just switch to my iPad and my iPhone. My brokerage account is with Schwab and I’m fine with their (new) app for my trading activities. For all my other personal finance needs, I am using LifeTopix. It has all the basic features I was looking for in order to track my accounts and bill payments. But it also provides asset tracking. I wasn’t specifically looking for that, but now that I have it and am using it, I find that it gives me a good feeling to know I have everything documented in one place (with photos, audio notes, etc.) for insurance purposes. This App is top rated on the AppStore and is a great one-stop App for real-time news and analysis on U.S. Politics. Financial Markets Today pulls deal news and longer articles from publications, journalists, analysts, hedgies, and banks who publish across the Web. The App continuously monitors and adjusts online source lists to include new analysts and publications as well as opinion leaders of note.The App’s user interface is beautiful and makes it easy to read articles and research on the iPad, simple and efficient. This is a great App for collecting and reading all this content into one place. It is one of the greatFinancial Markets news related App on the iTunes Store.